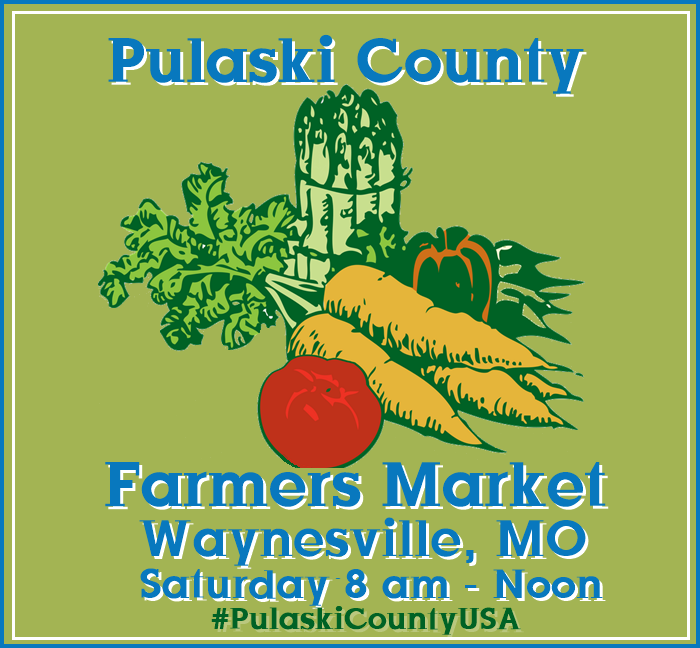 Ingress agents already know that Pulaski County is road trip country! 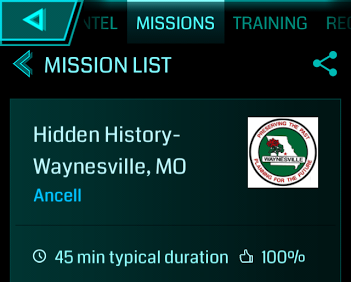 The area also has several missions that will make Ingress Mission junkies happy! 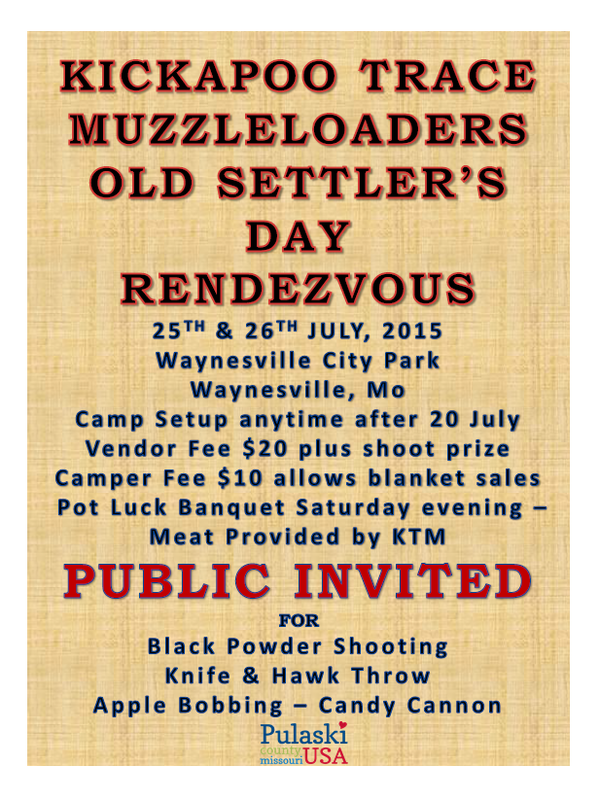 This week we shine the spotlight on “Hidden History, Waynesville, MO” created by Resistance Agent Ancell. 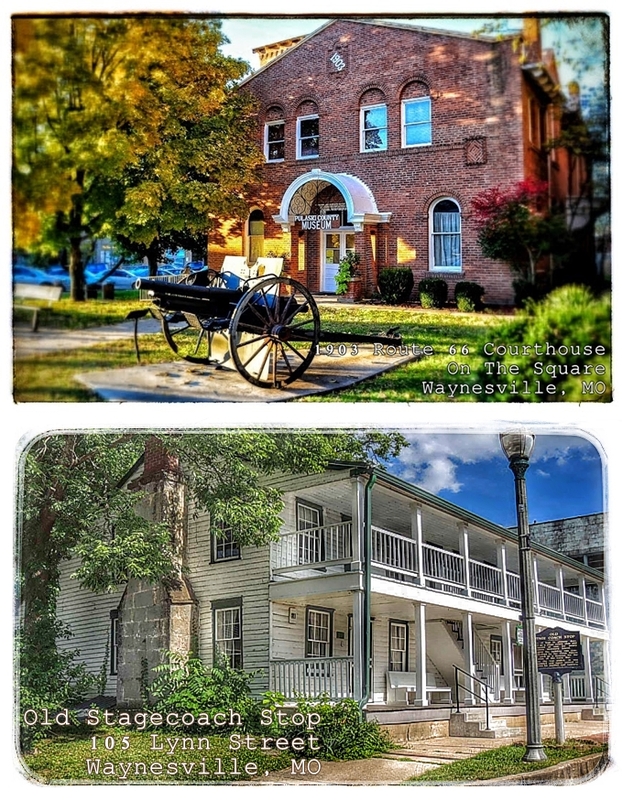 This mission tours some of Waynesville’s historical sites. The portal descriptions uncover hidden tales and legends of the downtown area & vicinity. You can complete the waypoints in any order. 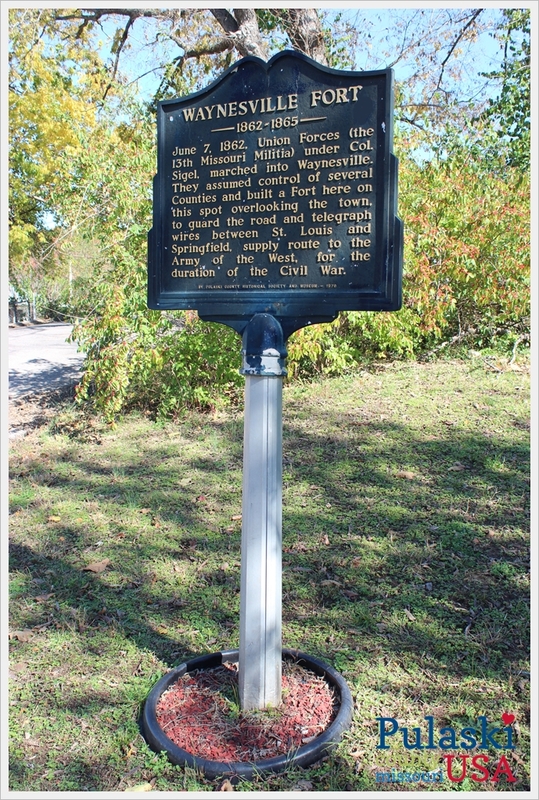 For more hidden history in Waynesville visit the Trail of Tears interpretive walking trail. 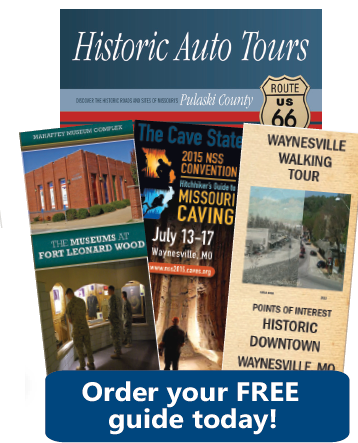 The Waynesville Walking Tour brochure features vintage images and can be found at many downtown businesses or at the Pulaski County Visitors Center in Saint Robert. Waynesville Water Tower- Just east of this water tower was the Waynesville Memorial Airport. The facility was dedicated October, 1948. 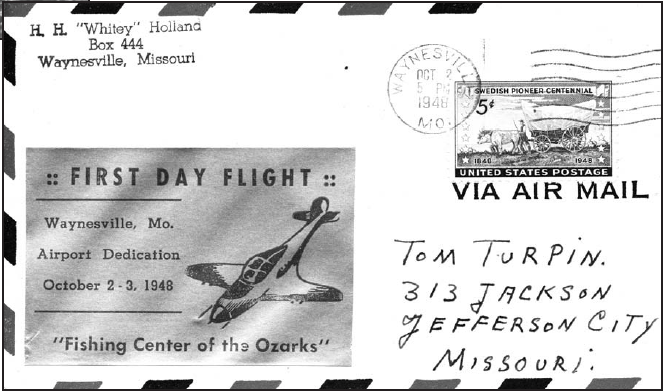 Waynesville’s Airport was dedicated October, 1948. Image contributed by Terry & Jan Primas and the Old Stagecoach Stop. 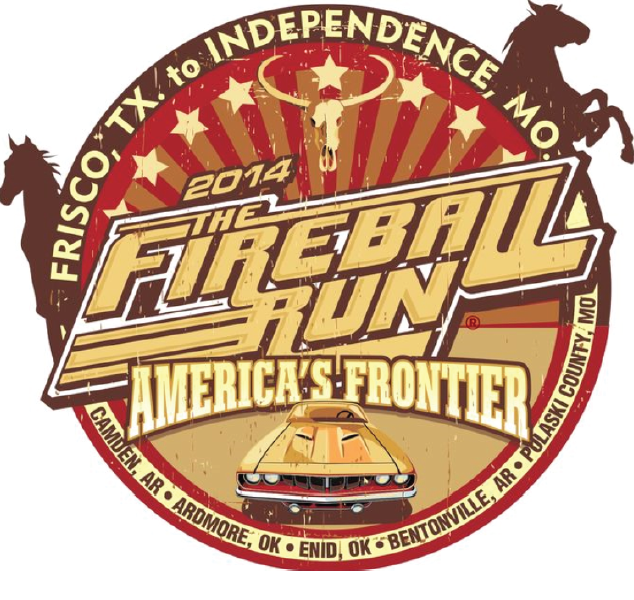 Frog Rock- A Route 66 icon, Frog Rock has greeted travelers to Waynesville since 1996. 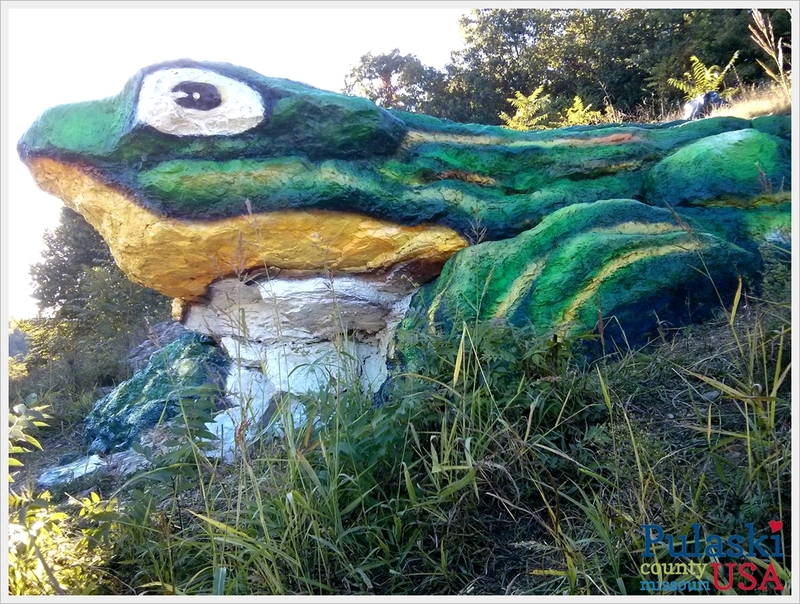 The frog was sculpted by tattoo artist Phil Nelson after the large boulder was left behind by MODOT after a highway widening project. Croaker’s “birthday” is celebrated each October during Frogtoberfest in Waynesville City Park. 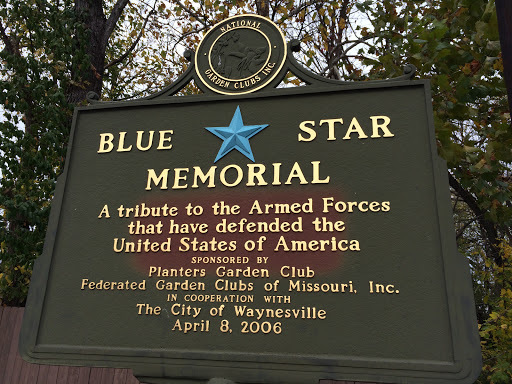 Blue Star Memorial- Erected by Planters Garden Club, Federated Garden Clubs of Missouri, and the City of Waynesville in 2006 as a tribute to the Armed Forces that have defended the United States of America. Old Stagecoach Stop–Built of logs in pioneer days, used as a stage coach stop and a tavern of rest for weary travelers westward bound. 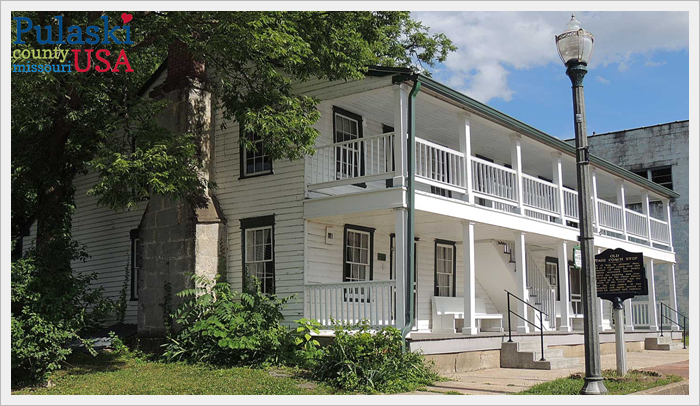 In 1862 the building was commandeered by the Union Forces and used as a hospital for the duration of the Civil War. After the war ended, it was remodeled and again served as a hotel for another half century. 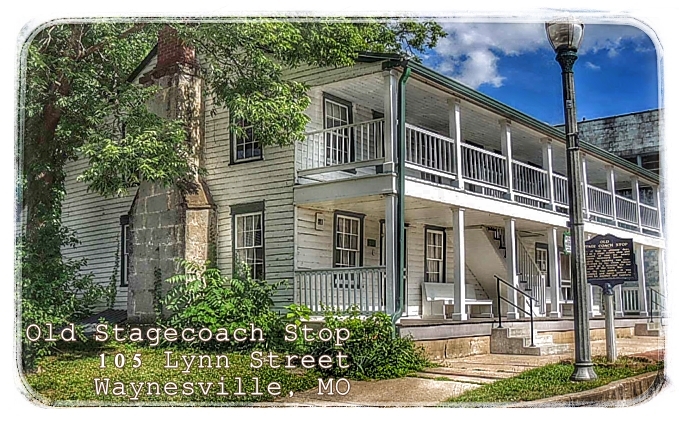 Old Stagecoach Stop in Waynesville, MO is an Ingress portal. Photo by Terry Primas. 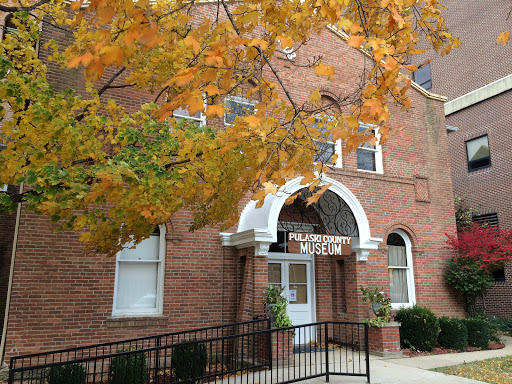 Pulaski County Museum– Pulaski County’s fourth courthouse was constructed in 1903-1904. The bricks were fired at a kiln in what is now Roubidoux Park. The building was designed by Henry H. Hohenschild and is on the National Register of Historic Places. 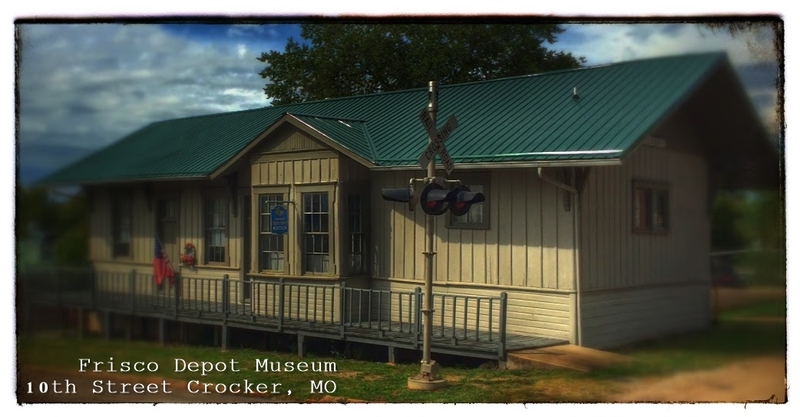 It is one of only two remaining period courthouses on Route 66 in Missouri. Today it operates as the Pulaski County Museum. 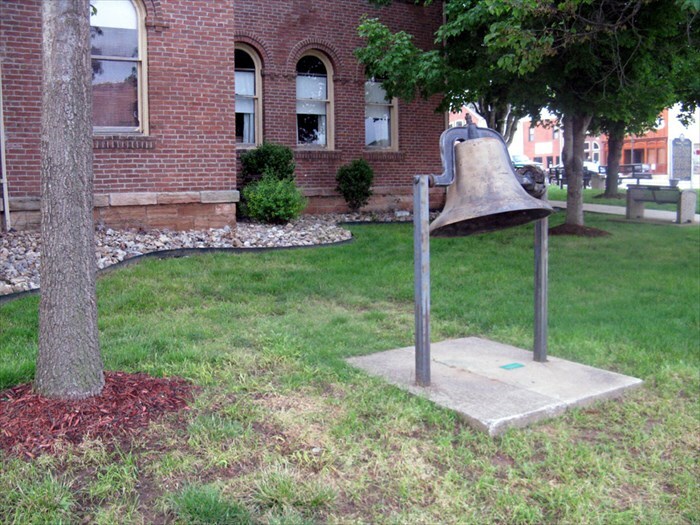 Bloodland Methodist Church Bell- Bloodland Methodist Church was organized in the late 1800’s on land that is now occupied by Fort Leonard Wood. Many Bloodland families attended the church and are buried in its cemetery. The church was razed and the cemetery is maintained by Fort Leonard Wood. 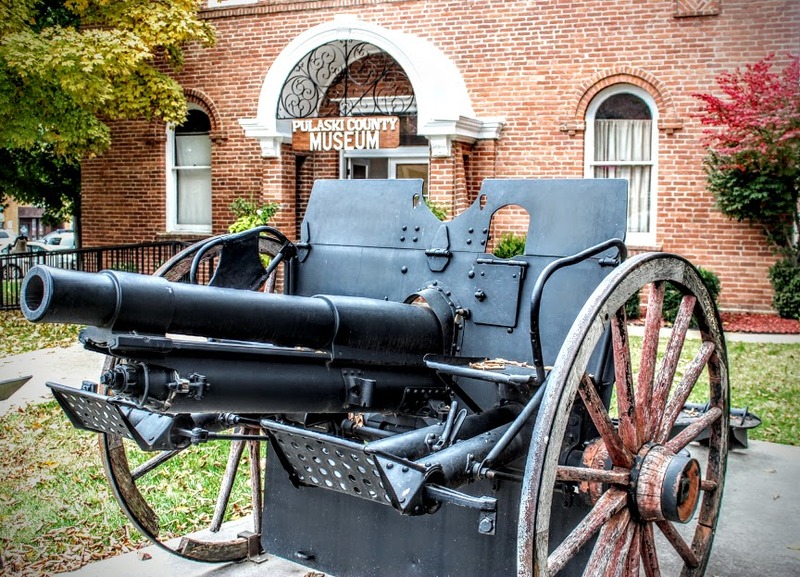 Howitzer Cannon Memorial- This cannon made its return as a fixture on the Square in 2010. Many years ago the cannon was removed by a group of local boys as part of a Halloween prank. The cannon was recovered by Luther Thomas and it “guarded” the entrance to Old Farm Estates for many years. The cannon was re-dedicated to the Citizens of Pulaski County by members of the Thomas family. World War I Cannon on Waynesville Square. 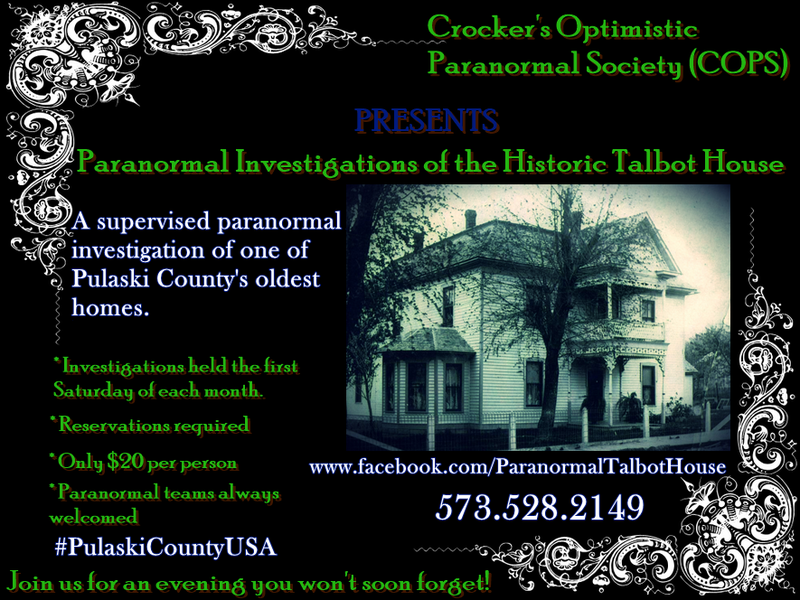 Image by Pulaski County Tourism Bureau. Korean Baptist Church- Formerly the Waynesville United Methodist Church, this building was built in 1945. The first Methodist Church on this site was built in 1887. 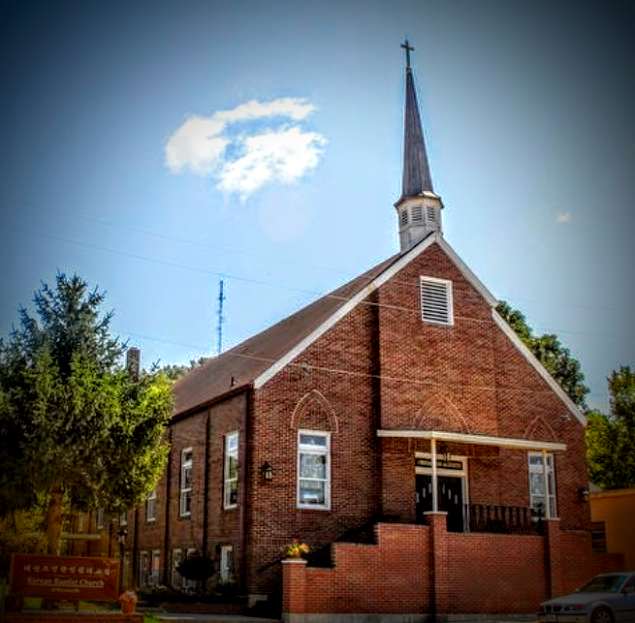 The Korean Baptist Church in Waynesville, Missouri formerly was the home of the Waynesville United Methodist Church. Image via Google. 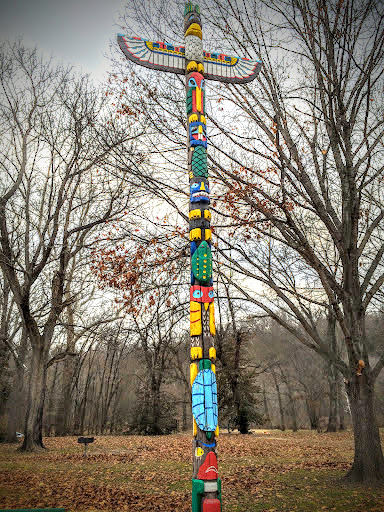 Totem Pole of Roubidoux Park- A gift from the Pulaski County Woodcarving Club circa 1985. Totem pole in Roubidoux Park. This work of art was created by members of a local woodcarving club in the late 1980’s. Image by Laura Huffman. Welcome To Roubidoux Park- The bricks for the 1903 Courthouse were fired in a kiln located on the grounds of what is now Roubidoux Park. 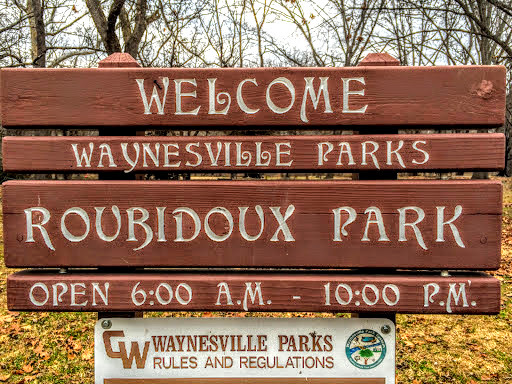 Roubidoux Park in Waynesville, Missouri. Image by Laura Huffman. First Baptist Church of Waynesville- Baptist churches were among the earliest to be established in the Waynesville area. This church was organized in 1880, and the first building, a log structure, was located at this site in 1887. The stone structure housing the fellowship hall was built in 1936. First Baptist Church of Waynesville by Mark Armstrong. Waynesville Post Office- Established as early as 1826 Waynesville Post Office is the longest continually operated post office in Pulaski County. Named for Revolutionary War hero Anthony Wayne. 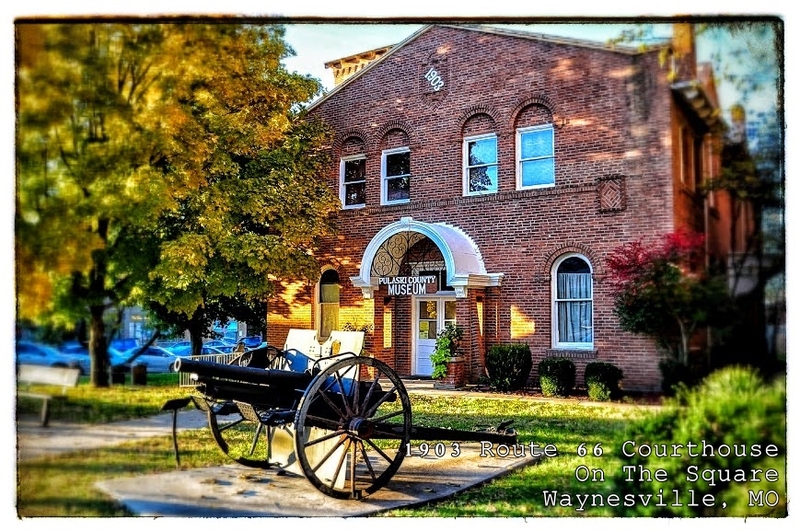 Waynesville Motor Vehicle & License Office- Located on the site of the former Victory Pub. Victory Pub was established by Greek immigrant George Morris in 1942. The pub was beloved by neighboring Fort Leonard Wood soldiers and Route 66 travelers for almost 70 years before being demolished in 2011 to make way for the DMV building. Waynesville Fort- June 7, 1862, Union Forces (the 13th Missouri Militia) under Col. Sigel, marched into Waynesville. They assumed control of several Counties and built a Fort here on this spot overlooking the town, to guard the road and telegraph wires between St. Louis and Springfield, supply route to the Army of the West, for the duration of the Civil War. Roy Laughlin Park- Roy Laughlin’s family roots in Pulaski County began circa 1851. The original homestead was located near Cedar Hill Cemetery on what is now Fort Leonard Wood. Roy, Nell, and family were one of the last families forced out of their land to make way for the new Army base. This park was gifted by Roy from the parcel that he purchased when he relocated in the early 1940’s. 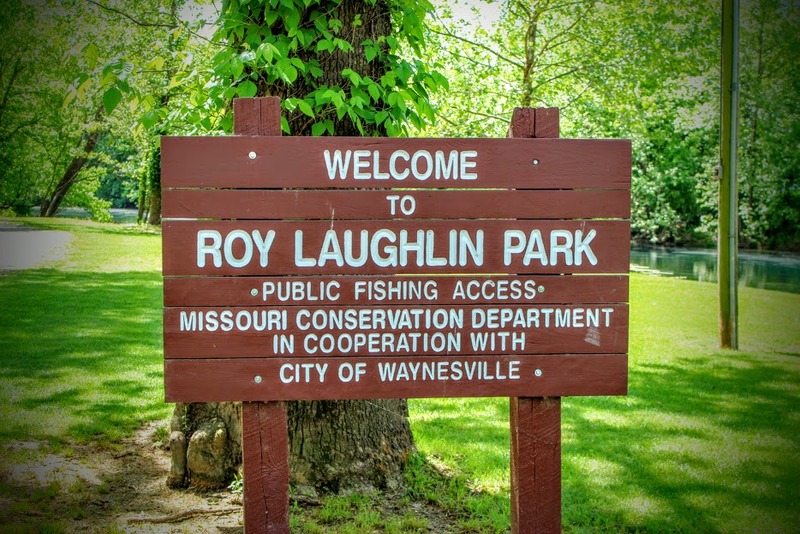 Roy Laughlin Park in Waynesville, Missouri. Image by Laura Huffman. Roubidoux Creek- This area was part of Pippin Place, a well known vacation spot. The lodge opened in 1914 and operated well into the 1960’s. Pippin Place was included in the influential “Duncan Hines Vacation Guide” and was considered the grand resort of the Ozarks. 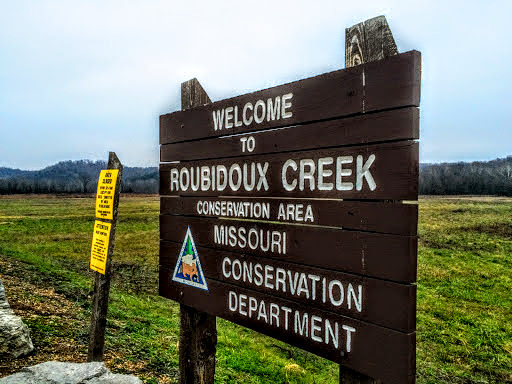 Roubidoux Creek Conservation Area. Image by Laura Huffman. Steve’s Place Mural- Relax with a cold beverage to celebrate your new mission badge! 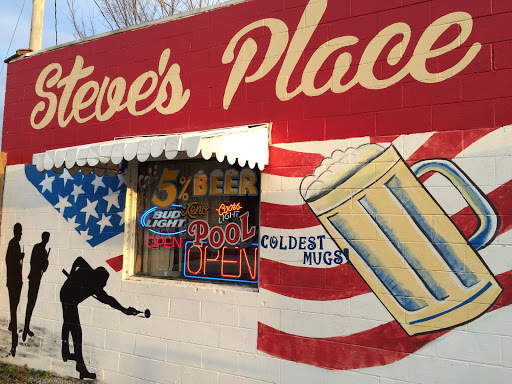 Steve’s Place on Route 66 in Waynesville, Missouri. Image by Laura Huffman. What: Pulaski County’s roller derby team, Wildwood Rollers, appear in their first home bout. 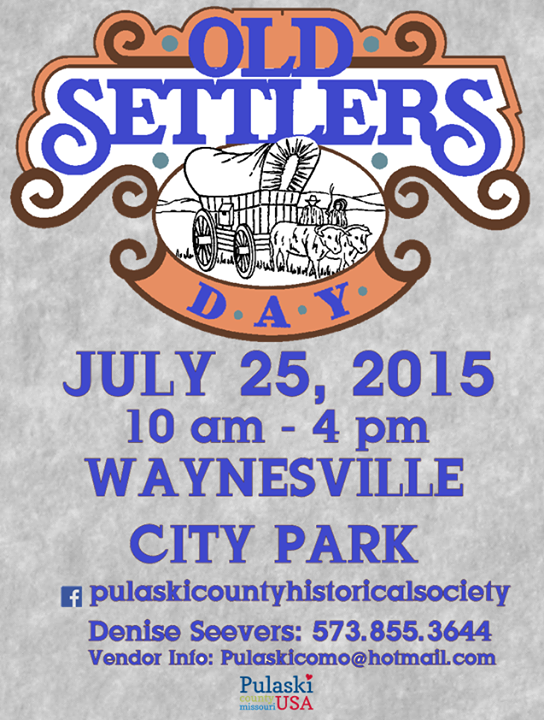 What: Festival celebrating area pioneers and settlers. Vendors, family activities. National Speleological Society Convention will be held July 13-17, 2015 in Waynesville, Missouri.